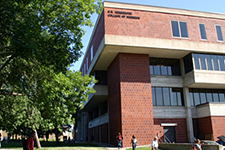 Centennial is the home of the Herberger Business School. Also housed in the five-floor building will be academic student services such as the Advising Center, Career Services, Student Disability Services, Honors Program and the Multi-Cultural Academic Center. Originally a library, Centennial Hall’s 1969 groundbreaking marked the University’s 100th anniversary. The building was completed in 1971. From 5th Avenue turn east on 8th Street S. Follow 8th Street three blocks to 2nd Avenue. Turn left; Centennial Hall is at the end of the cul-de-sac. The nearest public parking is the James W. Miller Learning Resources Center pay lot, the 4th Avenue/5th Street Pay Lot or the 9th Street/4th Avenue pay lot. Street parking may also be available.